Last week I made a new acquaintance. Sylvia lives not far from me and is a fellow crafter who reads my blog. We'd been planning a catch up since about November but my life got in the way so it was delayed until Mr E returned to work and Blossom was 'safe and sound' with her pregnancy. As Rosie was coming over for our regular morning tea/stitching get-together last Tuesday I invited Sylvia to join us, and what a nice visit that was. When she arrived I was handed a large paper cup which held an enormous goose egg. Knowing that I loved to bake Sylvia thought I'd appreciate her 'home-laid' gift and she was right. Initially I was going to use the egg to bake a sponge but when I popped my apron on this morning for a few hours of baking I decided to try a recipe Sylvia suggested, the Golden Cake for March. What a clever recipe this is! I've since discovered it's an old recipe, and one which Mary Berry uses. I love Mary Berry and almost everything she bakes. 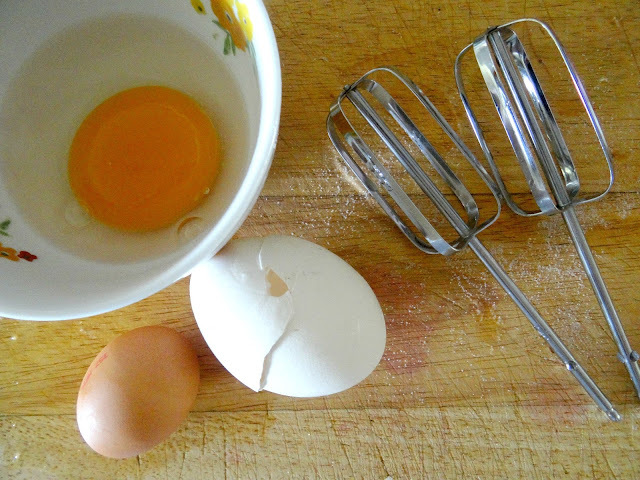 The recipe is actually known as the "weight of an egg" cake because you weigh the eggs and then add the same weight of butter, sugar and self-raising flour to give you one perfect cake! 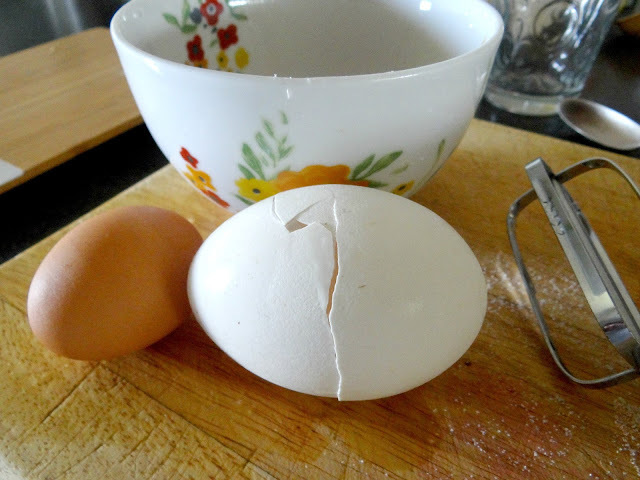 The goose egg when cracked weight 147 gms so I creamed 147 gms of castor sugar with 147 gms of butter before adding the egg and 147 gms of self-raising flour. I also added the grated zest of a lemon for flavour. I thought it might be nice baked in a ring pan (a bit quicker than a square or round tin) and 30 minutes later it slid out of the cake tin beautifully. 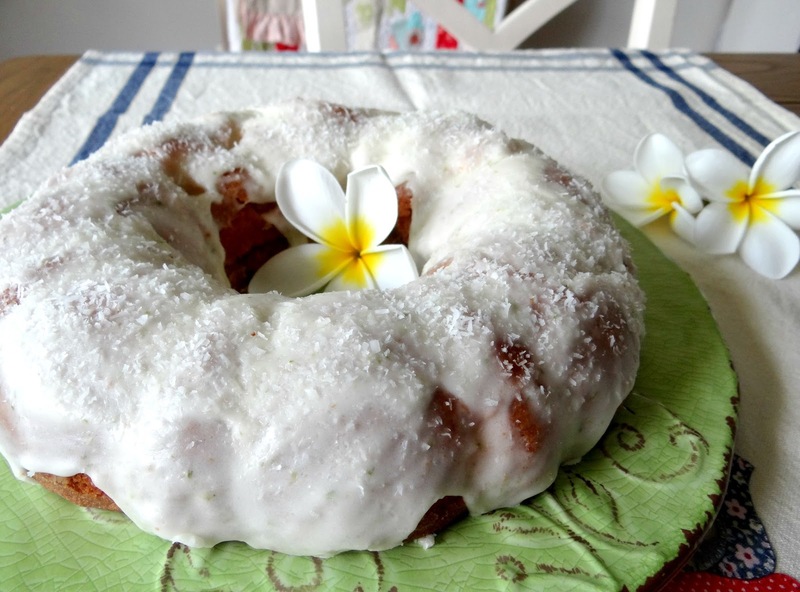 Once cooled I spread lime butter cream icing over the top before finishing with a scattering of coconut. Inside the cake is soft and golden, beautiful to eat...and the tangy lime icing is delicious too! As I'm visiting Blossom tomorrow the cake was just the start of my baking day. She loves having mum arrive with home baked goodies! I'll keep half aside for us and give Bloss the other half along with some of the goose egg cake. I had a reader ask recently "what is a slice" which made me think this is an Australian/NZ term and not used elsewhere? In the UK it would be called a traybake, but not sure what my American friends would call it. A slice is baked in a long tray and usually has two, perhaps three layers. It's not very high and is cut into squares for storing and serving. 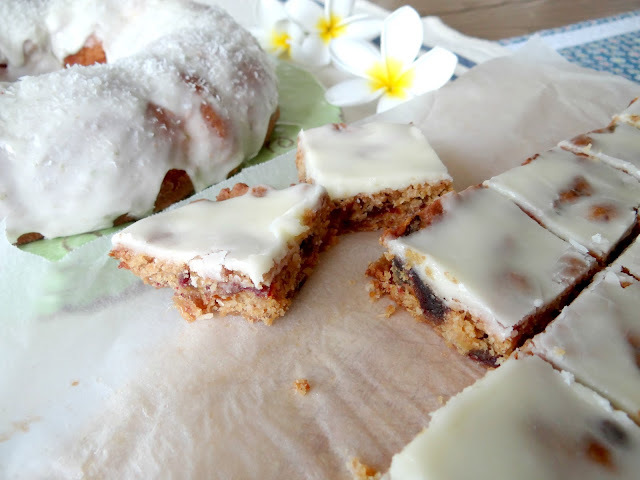 Scrummy Slice is baked in one complete layer with the iced topping added afterwards while it's still warm so that it 'just' begins to melt into the base. 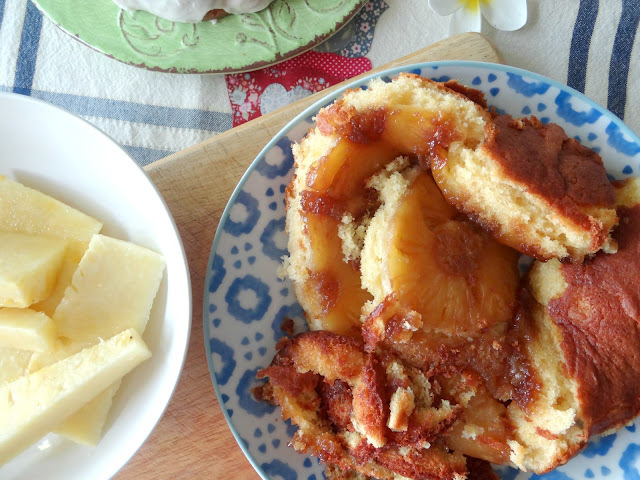 The third recipe I baked was a Pineapple Upside Down Cake. Mr E had requested 'old fashioned' hamburgers for dinner tonight (the kind we grew up with from the corner fish'n'chip shop with fresh beef mince, beetroot and pineapple, pickles, sauce and loads of onions) and the only can of Australian pineapple slices I could find was a really large one so I needed to use up the extra, and what better way that an Pineapple Upside Down cake? Now the odd thing here was that I didn't use my tried and trusted recipe, but used another from the Commonsense Baking book. Normally I make this in a large round tin with very high sides and that's the pan I prepared, so I greased the tin as usual, spreading the butter, brown sugar and pineapple across the base. 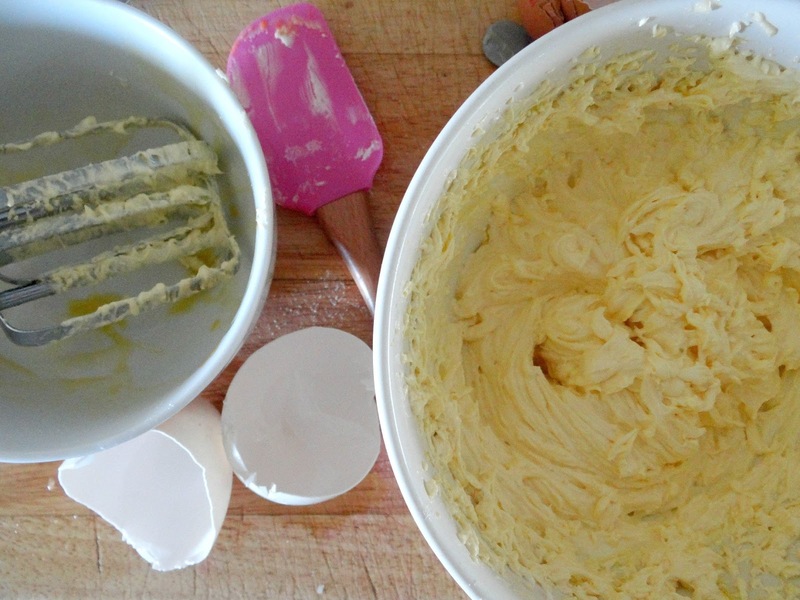 But then I made up the cake batter...and realised it was a much smaller amount than I normally make. Forging ahead I poured the batter over the caramel pineapple base and popped it in the oven for the suggested time. It looked great when I pulled it from the oven and following my regular habit it was left on the bench to cool for 15 minutes before turning out. Small cake in very large tin. Long way to fall from tin to plate. I flipped it right side up and the aroma was tantalising. That's when I remembered Mr E's words from another broken cake a few years back..."It still tastes the same when I eat it, so don't worry. It will be delicious anyhow!" Bless his heart, I knew he'd say the same about this cake. I made a lime jelly, bought some custard (not everything has to be made from scratch in an already busy day), and decided we'd have this 'trifle' for dessert the rest of the week. When he came home from work an hour ago and I told him he just licked his lips. 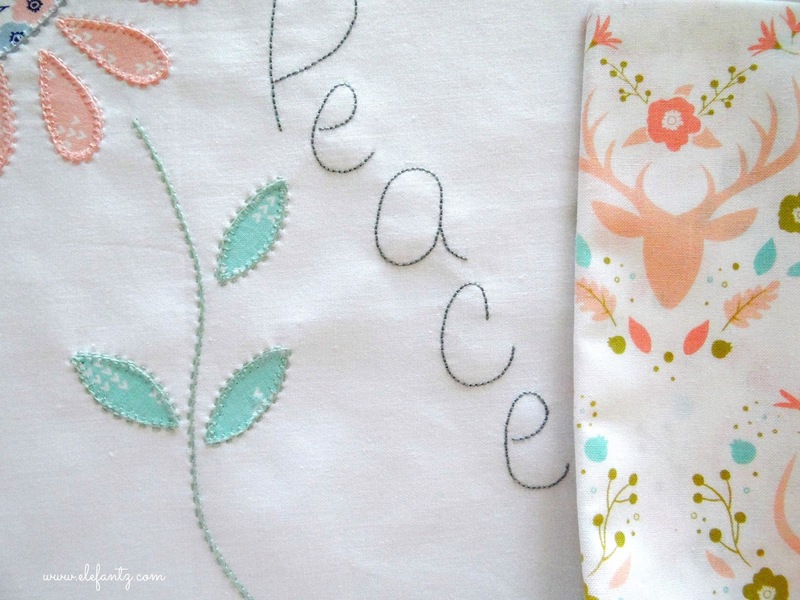 My dear and very talented friend Allie is hosting a Stitch-A-Long on her blog! 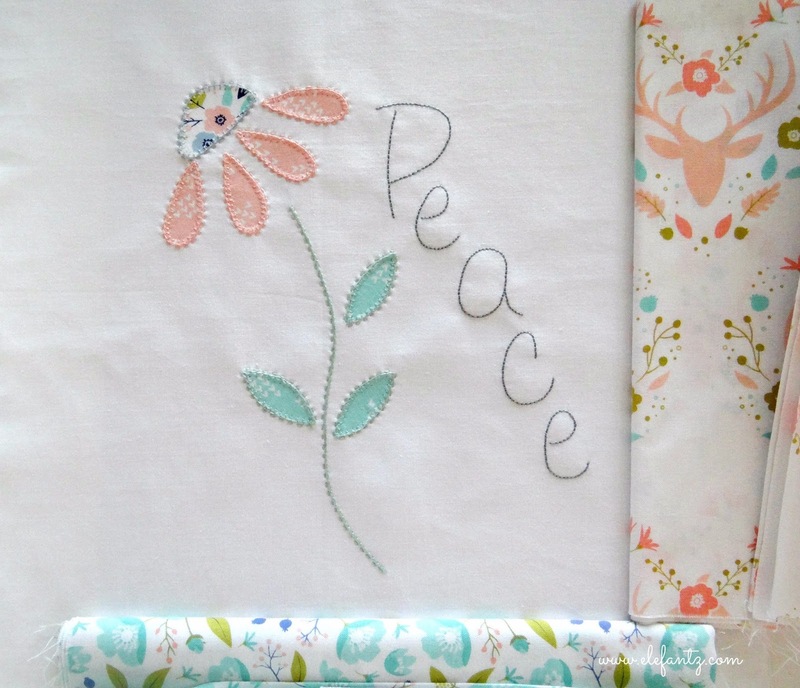 Every week until early April there's a new block in her "A Garden of Contentment" quilt and this week she began with the 'Peace' block. There's a blue in this range as well and at first I wasn't going to use it but you'll see next week that I changed my mind because it features in block 2. I've stem stitched the flower stem and added running stitch around the applique pieces and beside the stem. You'll see this a lot in my work...next to back stitch, running stitch is my favourite. 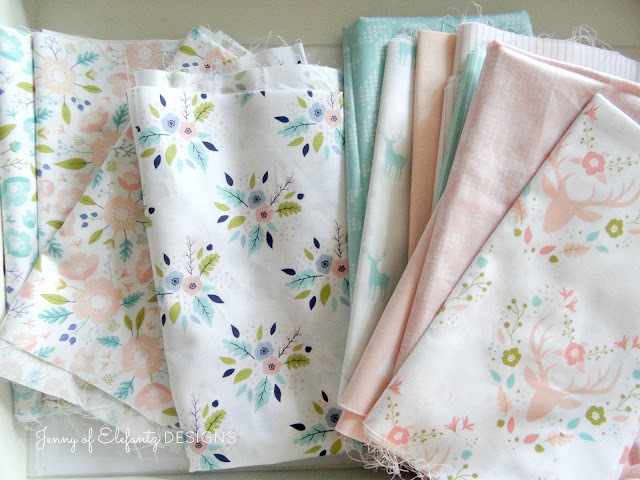 Visit Allie HERE and you may find yourself sewing along too! 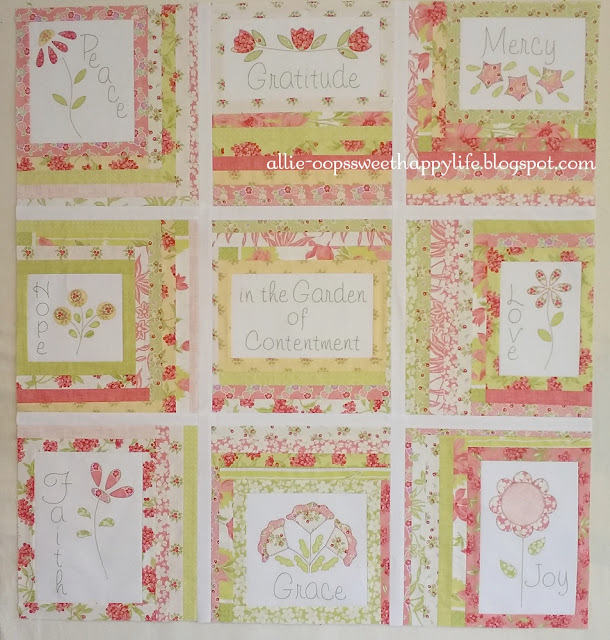 This is Allie's finished quilt top with all the blocks. I love it! I have a lot on my mind I want to write about but it will have to wait for another day, and another day, and another day. This gentle domestic life keeps providing the most wonderful rabbit trails to follow and I find myself learning more and more as I follow them. Hopefully I'll be back in a couple of days with the first of those thoughts. Until then, smile, laugh, be kind, give thanks and embrace even the smallest nugget of goodness because it may just keep you looking up when all else fails. Precious one, you are wonderful. The goose egg cake is very interesting! And it sure did turn out very pretty. About the pineapple cake, My mom always said the cakes that are 'ugly' taste the best... I'm sure the pineapple crumble cake was delicious!!! Allie's stitcheries are very pretty and it'll be fun to watch the stitch along. I can distinctly remember my Nan talking about weight-of-an-egg cake recipes 40 years ago. I've always vaguely wondered about what she meant. You've solved the puzzle for me. Mr HM, I may see this cake on your blog soon, yes? 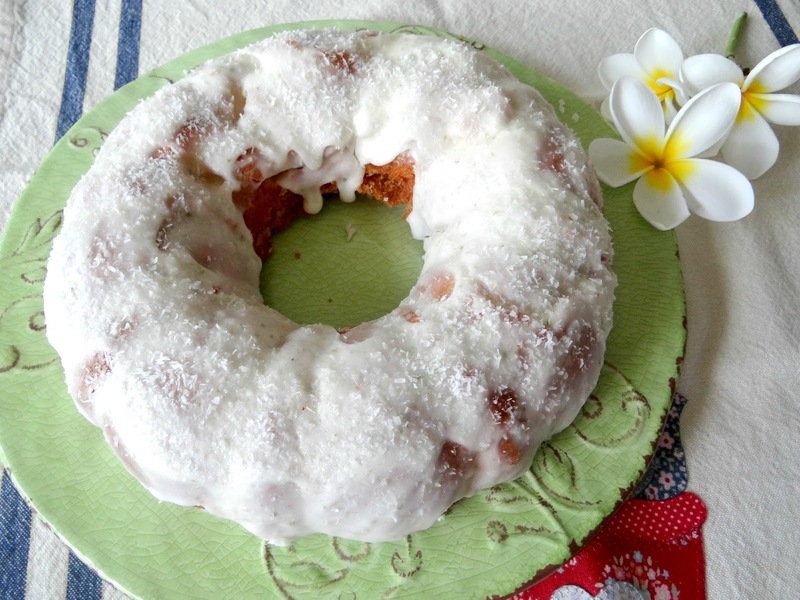 :-) It reminds me of another cake I used to make with equal measures of SR Flour, coconut, milk and sugar - but no eggs. I'd forgotten all about that one. Next week... LOL! Thank you for the lovely post. I feel like we are sitting down and enjoying a cuppa, a little goodie and a lovely chat. Plus a bit of stitching woven in! In Canada and the US, a "slice" recipie is called Squares. US here, and I think I hear "bars" more often than "squares" but i would recogreco either. There's probably some regional variation. Susan, it's very fine sugar, finer than regular sugar. I think it is was we in the USA call powdered sugar, Susan. I'm in the upper south region of the US & for us a slice cake is called a sheet cake because you bake it on a sheet pan or cookie sheet. We like them for potlucks & large crowds. In the U.S. Midwest, slices are called bars. Your pics and description of your yummy baking are so good that I can almost taste it. Pity I can't est it lol. Is a goose egg like a duck egg? They are very rich and have a beautiful yolk. Your block of Allie's BOM is beautiful. For some reason she has dropped off my blog list so I must pop over again. Jenny, I am smiling as I read this. After you explained a slice, I thought that here in the US, we'd call that a bar. Then after reading the responses on this post, I agree with the reader saying we'd call it a sheet cake. Sheet cakes are good for serving large crowds. When my daughter got married a few months ago, we had a layered cutting cake and then had several large sheet cakes for serving the guests. I love reading about terminology in different countries. I would love to know your recipe for the lime frosting on your cake. I bought a Bundt pan (circle pan) because of all the cakes you make in them make my mouth water!!! I'm going to try to make the Golden Cake adding your lemon zest and lime frosting!!! Thanks for making me hungry AFTER I finished dinner!!! Just a FYI, in the US castor sugar is what we call superfine sugar. You can buy it by the box or make your own from regular sugar by running it in a food processor for a little bit. 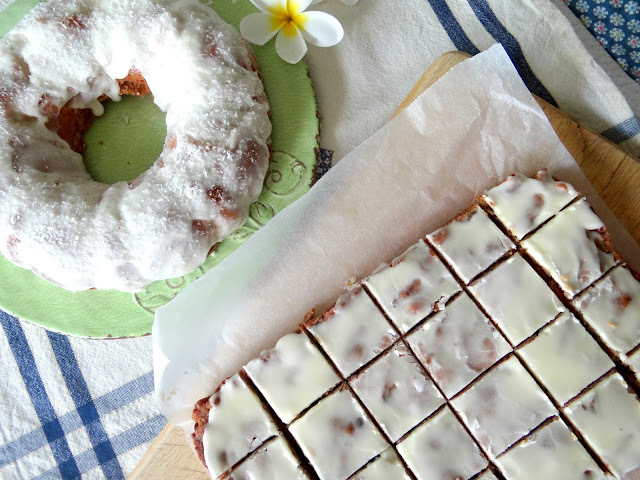 I put this cake recipe into my files and will give it a try soon. It sounds so good and easy. Thanks! 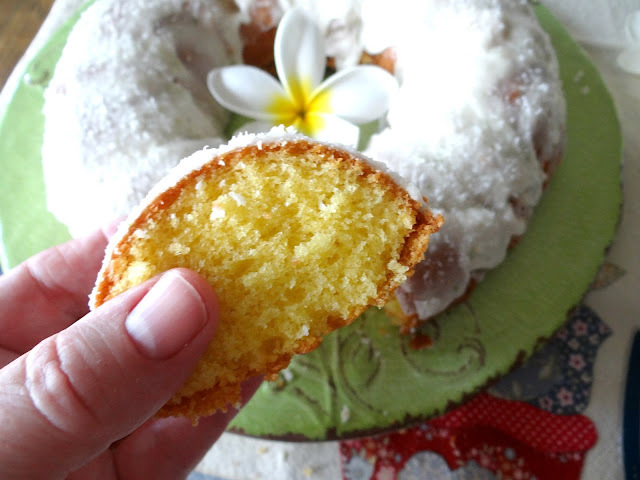 I love your story about the pineapple upside down cake! I cook in my classroom with disabled children. Yesterday I made mini cheesecakes for the first time. We were sending dinner to our art docent, Gwen, who had surgery. I thought the filling seemed a little thin, but what did I know....As I was putting the pan in the oven I realized the cream cheese was still sitting on the counter. Opps. I carefully scooped out the thin filling and added the cream cheese. It turned out so delicious! With cherry whipped cream, it was a hit! I've had dinner and now I want dessert, lol!!! I love anything pineapple and to have it already broken up ready to eat is divine. How lovely that you made a new friend, I'm so glad, and what a gift she brought you! That egg is HUGE! 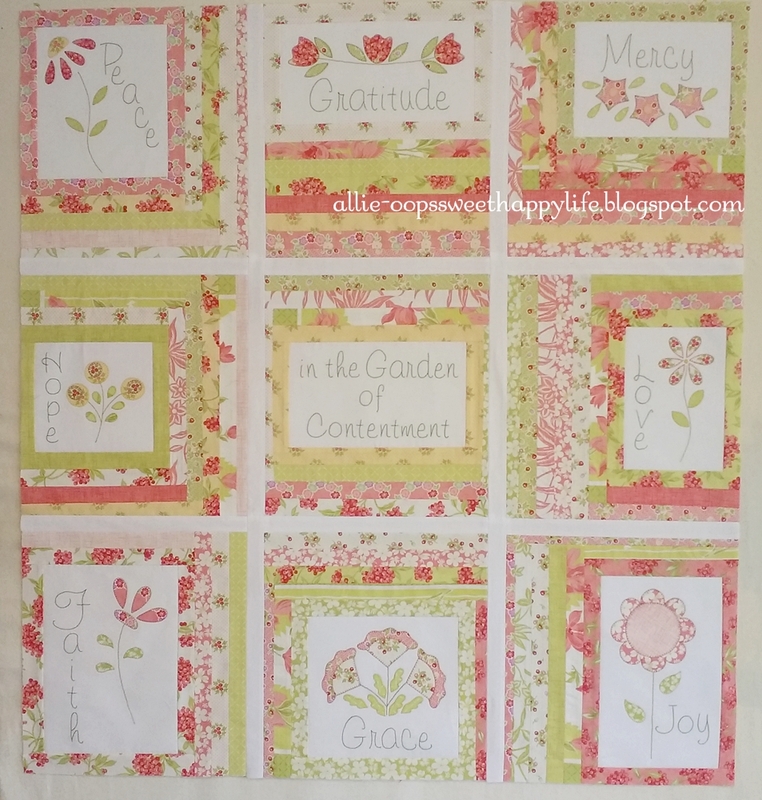 I adore your block, dear girl, that fabric is luscious!! I can't wait to see your block 2! And I'm really looking forward to those rabbit trails, I'm sitting here with a cuppa and wishing you were sitting next to me, but the way you write I feel almost as though you are. What a wonderful gift you have, dear heart! That's clever matching the weight of the egg to the other ingredients. The cake looks delicious & so does everything else. I wouldn't dare bake that much. I'd eat it all the time & put stones not pounds on!